Thomas Demenga, born 1954 in Berne, Switzerland, studied with Walter Grimmer, Antonio Janigro, Leonard Rose and Mstislav Rostropovich, among others. Important chamber-musical influences were Claus Adam, Felix Galimir and Robert Mann at the Juilliard School in New York. 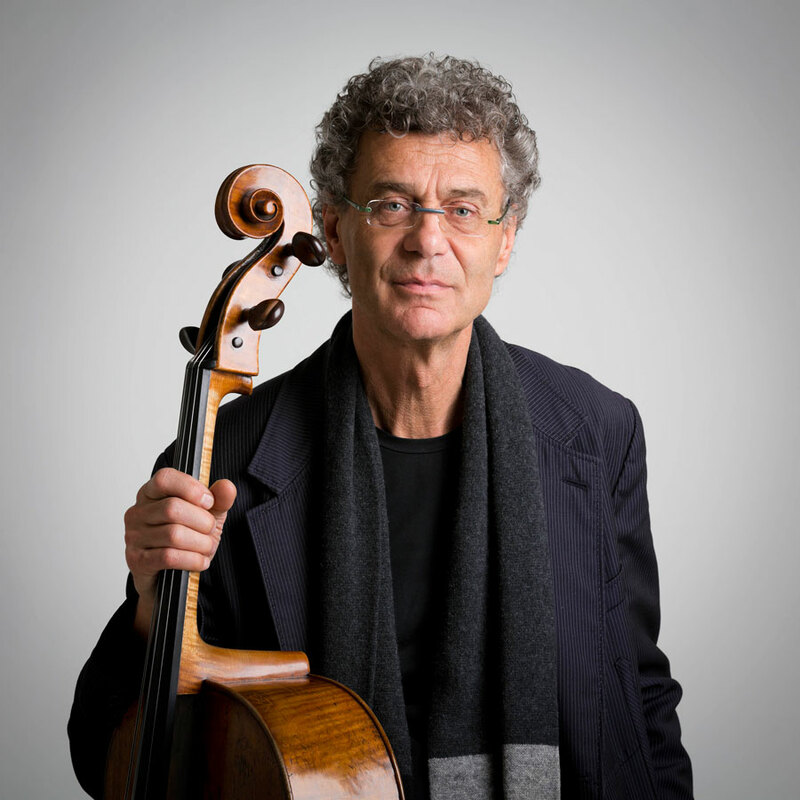 As an internationally renowned soloist, composer and teacher, Thomas Demenga counts among the most outstanding cellists and musicians of our time. He has performed at important festivals and musical centres around the globe and shared the stage with fellow musicians such as Heinz Holliger, Gidon Kremer, Thomas Larcher, Paul Meyer, Aurèle Nicolet, Hansheinz Schneeberger, Thomas Zehetmair and Tabea Zimmermann. He works with conductors such as Moshe Atzmon, Myung-Whun Chung, Charles Dutoit, Claus Peter Flor, Howard Griffiths, Heinz Holliger, Armon Jordan, Okko Kamu, Mstislav Rostropovich, Dennis Russell Davies, Wolfgang Sawallisch, Sándor Végh, Mario Venzago, and Hiroshi Wakasugi. As a soloist he has collaborated with, among others, the following orchestras: Berliner Sinfonie-Orchester, Berner Symphonie Orchester, Boston Symphony Orchestra, Camerata Bern, Junge Deutsche Philharmonie, Kammerorchester Basel, L’Orchestre de Chambre de Lausanne, L’Orchestre de la Suisse Romande, Nieuw Ensemble Amsterdam, ORF-Symphonieorchester Wien, Sinfonieorchester Basel, Sinfonietta Basel, Tonhalle-Orchester Zürich, Westdeutsches Rundfunk Symphonie-Orchester, and Zürcher Kammerorchester. Thomas Demenga’s artistic work is determined by intensive confron-tation with different historical eras and styles of interpretation and composition. He dedicates himself with particular intensity to New Music and is also active as an improviser. Thus his individual voice as a composer and interpreter of 20th and 21st century works (among them important prèmieres) gives a new and complementary dimension to both the historical performance practice of baroque music and his virtuoso interpretations of the classical and romantic repertoire. In 1991 he was the first Swiss composer to be awarded first prize for his composition «solo per due» by the congress of the «Tribune Internationale des Compositeurs». Since 1980 Thomas Demenga has led a class for students and soloists at the Hochschule für Musik in Basel. In August 2000 he was composer-in-residence at the Davos Festival, «Young Artists in Concert», and was subsequently appointed artistic director of the festival. In 2006 he gave up this position in order to commit himself fully to performing and composing again. In the Lucerne Festival in summer 2003, Thomas Demenga participated as «artiste étoile», succeeding Sabine Meyer (2000), Anne-Sophie Mutter (2001) and Alfred Brendel (2002), Thomas Quasthoff (2004), Christian Tetzlaff (2005) and Emanuel Pahud (2006). Thomas Demenga’s work is documented impressively on a number of CD recordings on the ECM New Series label. In 2002 ECM issued the final volume of a widely-acclaimed series begun in the mid-80s whicgh combined Bach’s solo suites with works by modern composers such as Holliger, Carter, Veress, Zimmermann, Yun and Hosokawa. His latest CD “Chongur” with Thomas Larcher and accordianist Teodoro Anzellotti has been awarded with the “Deutsche Schallplattenpreis”, “Fono Forum: Star of the Months”, “Grammaphone: Editors Choice” and “Le monde de la musique: le choc du mois” (ECM 1914). Last season he played the six Bach solo suites combined with modern solo works in three succesful concerts in London’s Wigmore Hall.